John Ellis "Jeb" Bush is an American businessman and politician who served as the 43rd Governor of Florida from 1999 to 2007. Bush is the second son of former President George H. W. Bush and former First Lady Barbara Bush, a brother of former President George W. Bush, and grandson of the late Senator Prescott Sheldon Bush. He grew up in Houston, Texas. He graduated from the Phillips Academy in Andover, Massachusetts and attended the University of Texas, where he earned a degree in Latin American affairs. Following his father's successful run for Vice President in 1980, he moved to Florida and pursued a career in real estate development. 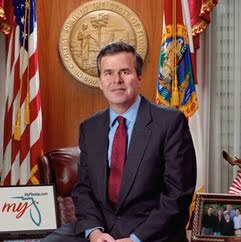 In 1986, Bush was named Florida's Secretary of Commerce, a position he held until his resignation in 1988 to help his father's successful campaign for the Presidency. In 1994, Bush made his first run for office, narrowly losing the election for governor by less than two percentage points to the incumbent Lawton Chiles. Bush ran again in 1998 and defeated Lieutenant Governor Buddy MacKay with 55 percent of the vote. He ran for reelection in 2002 and won with 56 percent to become Florida's first two-term Republican governor.